We know homes. We know San Antonio. We do more than buy and sell properties. First and foremost, we are San Antonio residents: experts in our communities, guiding our clients to the neighborhoods and homes that fit their unique lifestyle. Whether you want a quick sale or a new home, tell us what you want, and we’ll find the right fit. Located on the eastern cusp of the San Antonio-New Braunfels statistical area, Schertz and Cibolo offer neighborhood-oriented towns reaping the benefits of big-city amenities coupled with a community that attracts both military personnel from nearby Randolph Air Force Base and civilian families interested in the classic suburban lifestyle. Marked by breathtaking views, sprawling oaks, and charming small towns, the unique Hill Country landscape stretches for miles, leaving space for a diverse array of neighborhood styles and property types. An ever-expanding section of the city, North San Antonio boasts top school districts, expanding shopping centers, and a diverse blend of housing. From starter homes to sprawling estates tucked behind security gates, this highly sought after area draws in residents with the promise of growth and the beauty of Hill Country views. As an established pathway for growth and innovation, San Antonio’s Northwest corridor has become a hub for the city’s best and brightest. Not only is the area home to some of the most notorious upscale communities in San Antonio, it is also home to many of the city’s largest employers, as well as exclusive leisure and shopping destinations. Affordable housing, close proximity to Randolph Air Force Base, the coveted North East/Judson Independent School Districts, and ample shopping (The Forum and Rolling Oaks Mall) complement the classic suburban draw of Northeast San Antonio. On the burgeoning crown of San Antonio’s metro area, North Central SA offers the coveted combination of up-and-coming homes and upscale, established communities. Marked by mature oaks, excellent school districts, a variety of neighborhoods, gated communities, and architectural options, this area is close to the urban amenities of the city while still retaining a suburban vibe. One of the fastest growing areas of the city, the western edge of San Antonio’s metroplex features extensive master-planned communities with enviable amenities, a variety of home types, and a coveted school district. Home to iconic venues such as the Alamodome, central east San Antonio’s urban landscape offers a variety of communities including several historic neighborhoods that have become a hotspot for gentrification. Composed of historic neighborhoods, iconic communities, and classic shopping and attractions, Central San Antonio exudes charm and an old-world appeal. As the original, historic suburbia of San Antonio, the Central West area is an eclectic combination of the historic Deco District, mid-century homes, area amenities, and historic attractions with an artistic bend. As the urban center of the Alamo City’s growing sprawl, downtown San Antonio boasts trendy hotspots, quirky vibes and a mix of charming historic neighborhoods and contemporary new builds. Follow the San Antonio River south towards Missions National Historical Park, and you will find a wealth of history, diverse neighborhoods, area restaurants and shopping centers, and plenty of urban resources in southern San Antonio. Of the largest and most recognizable neighborhoods on the far north side of San Antonio is the neighborhood of Stone Oak. 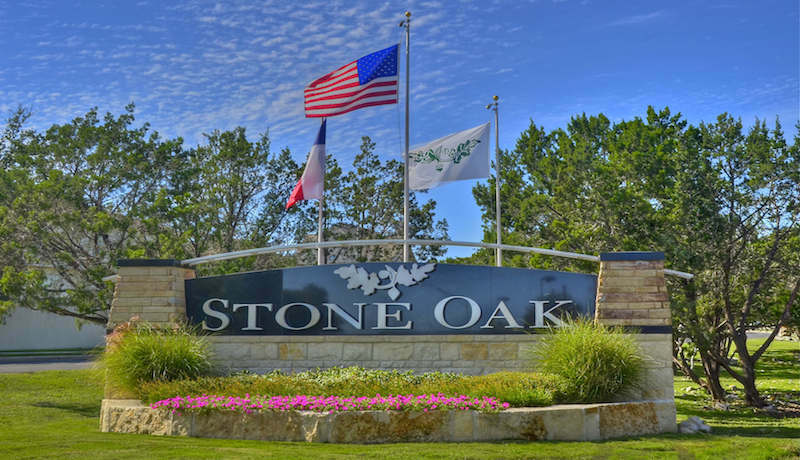 As one of San Antonio’s original master planned communities, Stone Oak features excellent schools within the acclaimed North East Independent School District, an extensive amount of restaurants, hospitals, and shopping centers, and easy access to major highways. Make today the day you begin the next fulfiling chapter in your life and career.